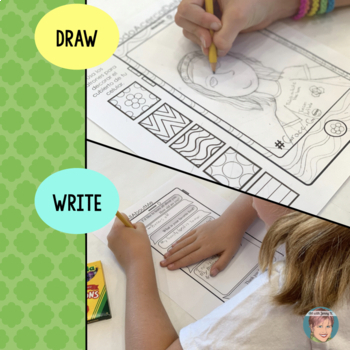 All About Me "selfie" drawing and writing activity for classroom teachers and art teachers. This is great way to start the year with an introduction and end the year with a reflection! 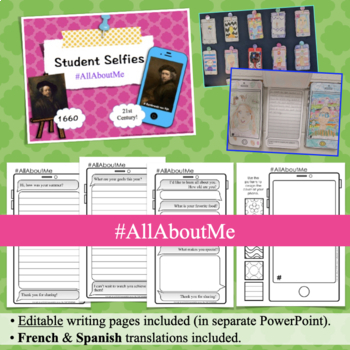 This All About Me product is a TpT teacher favorite! It's a great first week of school / back to school activity that is also useful at other times of the year--Back to School, Halloween, New Years, and End of the Year. 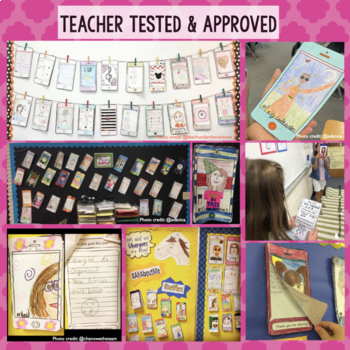 My student selfie drawing/writing activity is going to have you on the "favorite trendy teacher" list with your students (and parents) for sure! The 21st century teacher is hip and in with the times--this lesson will prove that to your students! You may also like my All About Me Collaborative Tessellation Project. The classroom collection of these student selfies make for a great bulletin board display!! 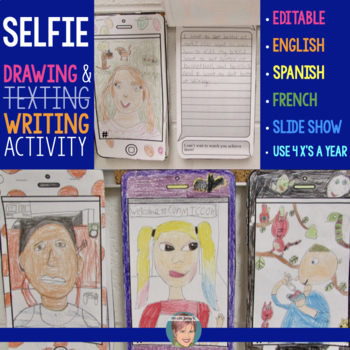 Using the templates I have created, students draw their selfie (self portrait) onto a smart phone template handout. They then select from the variety of text message (writing prompts) and answer questions for back to school, Halloween, New Year's or end of the year. I have included lines for students to write on for these writing prompts. This dowload comes with a pdf and a Power Point presentation with examples of "famous selfies" using artists like Andy Warhol, Frida Kahlo, Rembrandt and Van Gogh. Through this fun slide show students will get to see a modern twist on self-portraits as they commonly call them selfies. This lesson is so much fun and your kids will love it! NOW INCLUDED This file now includes a power point file with editable slides so you can adjust the product perfectly to your language and interests. Please have a working knowledge of power point if you intend on editing these slides by inserting text boxes. ~Art history slides of Rembrandt, Van Gogh and Kahlo. ~Blank art history slides so you can add in an artist from your local area or any artist of your choice. ~Blank instructions with images only so you can translate my english direction to any language you would like. ~Blank text messaging pages so you can write any writing prompt that you want. Use this lesson to assess your students fine motor skills, drawing skills, creativity and overall willingness to put effort into their work. You can tell a lot about a child by their artwork--especialy their self portraits (err, I mean selfies). Most of all have some fun and let your students show off their creativity to you! This lesson is not a formal drawing lesson, however it could easily be combined with one. If you like this selfie lesson you'll LOVE my iDesign an App lesson as well.Your kids will amaze you at what they can come up with! Please note that this is a zipped file. If you have any trouble unzipping this resource after purchase please start by looking HERE for help from TPT, you can also submit a ticket to TPT and they can help you open this file. I create my products on a mac and every now and then there is an extra step involved in unzipping the file. © Copyright 2015 Art with Jenny K.® ALL RIGHTS RESERVED. Permission is granted to copy pages specifically designed for student or teacher use by original purchaser or licensee. The reproduction of any part of this product is strictly prohibited. Copying any part of this product and/or placing it on the Internet in any form (even a personal/classroom website) is strictly forbidden. Doing so is a violation of the Digital Millennium Copyright Act (DMCA).